Just Jingle: It's Stampendous Saturday! Color Challenge Time! It's the second Saturday of December, and the Stampendous team is playing along with a color challenge…to use pink, cream, gold, and/or brown in a card or project. The colors can be by way of papers, coloring implements, inks, and/or any of the fabulous Stampendous Essentials. If you've been stuck in a traditional holiday color mode, this is your opportunity to think outside the Christmas crayon box! Please join us in our challenge this month, and link your creation(s) to the InLinkz located on the Stampendous Impressions' blog (or any team member's blog post that has the collection at the bottom). You don't have to use Stampendous images and/or products on your designs…but we sure love it when you do! You have until January 5, 2012 at 11:59 PM EST to enter your creation, for the opportunity to be the one lucky random winner to receive this fabulous Stampendous prize, the Amore Frames Perfectly Clear set. I created this super fun and super easy set of tags! I stamped the Christmas Year stamp in part on each one. I added a small icons from Charm set and embossed them with gold enamel. Then, I simply finished them off with some twine from The Twinery! Check out the other girls' fabulous projects! Link up your project here! I LOVE THESE!!! What a fabulous idea!!! Love the Aged Gold embossed charms too!! Have a good weekend! Pretty, elegant, AND fun! Not to mention USEFUL! LOVE THEM! The subtle sparkle of the pink with a punch of gold is so beautiful...definitely feminine and chic. Gorgeous tags, Jennifer! I love the shimmer and gold embossing. cute tags!! love that sentiment set you used!! great job! These are adorable. 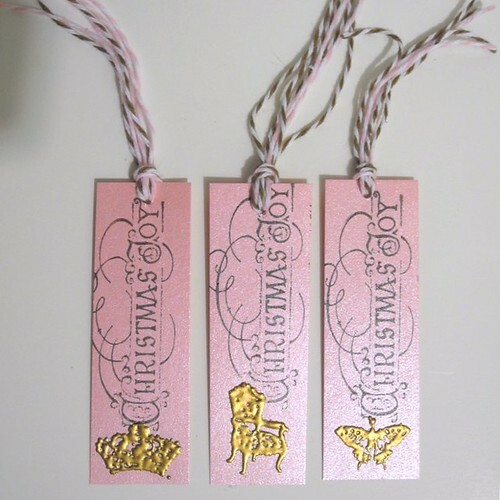 I love the gold embossed charms against the pink. Great job! What a super cute set of tags! Love the pop of gold on the stamped charms! Wonderful + great gift idea! Super fun tags! Lovely elegant touches of gold embossed images on the bottom. 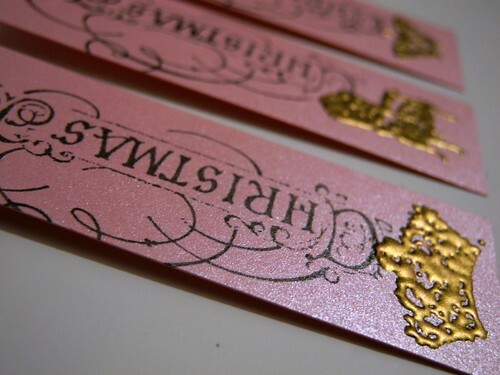 Love these bookmarks! What a great addition on a gift or just as a thinking-of-you gift. 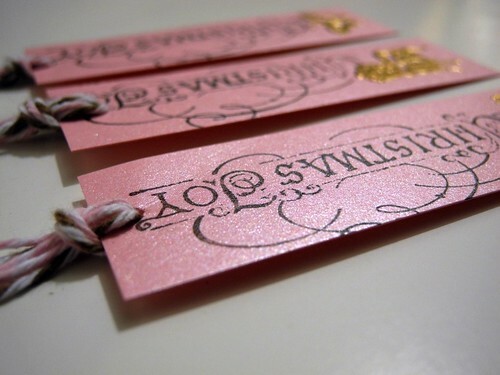 Great tags..love the shimmer and shine and the embossing! Gorgeous!!! Loving the gold enamel with the images!! !